Synopsis (via Goodreads): Annie Mathers is America’s sweetheart and heir to a country music legacy full of all the things her Gran warned her about. Superstar Clay Coolidge is most definitely going to end up one of those things. "I’m also locking away my lady parts. Their objection is fierce, but what can I do? They’re clearly working against me. Stupid magic Levi’s." 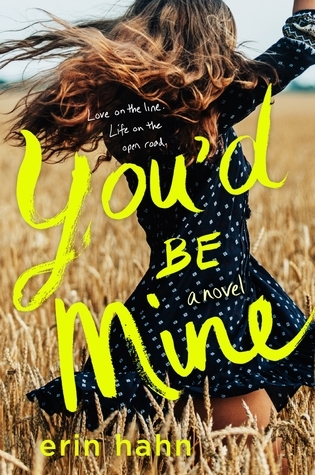 You'd Be Mine was such a fun book! I really enjoyed the characters, the summer music tour, and the songs the author included throughout the story. Someone should definitely record those songs so we have something to sing along to! Books like this always bring out my Texas twang. It's so hard to read a southern drawl without actually doing it in my head, and then it just pops out in conversation. I thought I had kicked the habit years ago, but apparently not! I also loved the terminology and phrases the author used (like janky and such), because you don't see them too often in other books. County music isn't really my jam these days, but it was absolutely perfect for this book. I enjoyed learning about Annie and Clay's (Jefferson's) history, and would love to revisit their world in the future. I really want Jason to get his own book, because I'm curious about the beach he found one summer during band camp. Who did he go with? What happened? There seemed to be more to Jason than his goofy exterior, and I want to know what it is! Kacey and Fitz were adorable together, too. I even liked Lora for a little bit, and thought her role was essential to the story, even if she eventually made me angry. Trina and Connie were awesome tour managers, and we see that they care about the people they work for. We may not get too many details about them, but they felt real and honest. Everything about this book felt authentic and believable. Annie's grandparents, both her and Clay's interactions with fans, and their performances on stage. I liked that Annie always kicked her shoes off and really embraced herself despite her growing popularity. She knew who she was, and who she didn't want to be, and she tried very hard to keep those two things separate. Clay's family is equally complicated, and I'm happy we get to see some closure for him as well. There was very little angst in You'd Be Mine, and the drama was kept to a minimum. It was a story about two people struggling with their identities, despite having very recognizable names. They're teenagers in the spotlight, so their mistakes are public knowledge, and their personal lives are hard to keep a secret. I thought both Annie and Clay handled themselves very well, and were honest about their faults (at least to themselves). Overall, this book was about friendship, family, and a love of music. The characters were mature and memorable, and the story made me smile nonstop! I recommend this book if you're looking for something summery and sweet! I've heard nothing but great things about this one. Glad you enjoyed it to! I hope you have a chance to read it soon! I know you've been crazy busy as of late. Trying to get poor Figment to come out from underneath the bed! Our cats have adjusted to moves pretty well, but maybe they're used to it. I hope he settles in soon. Is Fonzi enjoying all the new trails and sights? I actually really like country music, so this sounds like a fun read! I've seen this one around buy have to admit I hadn't even bothered to read the blurb. Now that I have, I've added it to my amazon wishlist, lol. This sounds like something I'll adore. I really liked this book. I am a sucker for two broken people healing together. Same! They were different kinds of broken, but they understood each other. I also like that their problems were their own, and they handled them individually. Yes, Annie does intervene on Clay's behalf at one point, but I also think that was for the benefit of both bands as well. They all needed the reprieve. Annie had to deal with her demons, and Clay had to address his past. I loved that they supported each other, and knew when to stop acting on their feelings. Neither of them was ready for a deep, romantic relationship, and I'm glad the author took her time with it. Yay!! I'm glad you enjoyed this one too! I look forward to seeing what Erin Hahn has up next! I am so glad you enjoyed this one, Lindsi! I thought it was really well done and just loved Annie to death. Annie was adorable! I loved her personality, and how determined she was to be her own person. I also like that she and Jason were such good friends despite a failed attempt at romance, haha. I've been seeing this book a lot lately! It sounds so interesting and I love a good romance. I'm going to add this to my library list! Cool she has a youtube channel for her music. That is the thing for kids now a days. Sometimes need a good book with little angst and low drama. They don't really focus on the online aspect of her music, only referencing it in the beginning when the label wanted Clay to talk to her. When her videos went online, people assumed Annie was ready to go public with her music, which wasn't necessarily true. Although, you're right... a lot happens on YouTube these days!